This article originally appeared at The Black Giraffe blog on Tuesday, April 17. When I read a draft of Walk in Love: Episcopal Beliefs and Practices, I was elated. Here, finally, was the book about the Episcopal Church that I had wanted to give to inquirers for my entire ministry. The love that Scott Gunn and Melody Wilson Shobe have for their church infuses the entire volume, and their desire to explain their beloved church to others is thorough, readable, and insightful. Three qualities make Walk in Love particularly valuable to anyone looking for a book about the Episcopal Church. First, this volume focuses on the key elements of who we are from the perspective of what is most important to us, instead of trying to differentiate us from other flavors of Christianity. The book opens with the liturgy and the sacraments, which are the central elements of our worship and a key experience for our common life. Second, this volume is thorough, covering a lot of ground to describe many important aspects of our faith. After the sacraments, Gunn and Shobe look at how we pray at different times, our basic beliefs, how the church is structured, the Trinity, and how we live out our faith more deeply. At 338 pages, the book is long, but the chapters are short, with each section broken up into easily digestible pieces. Finally, the book is accessible, with a clear organization, personal stories, reflection questions, pull-out boxes, and a writing style that doesn’t assume any particular background. Reading Walk in Love is like having two dedicated guides leading you through their favorite community, explaining what is happening, why it is happening, and why it is so important to them. Gunn and Shobe are sharing how the Episcopal Church embodies and proclaims the good news of Jesus Christ. Their work is generous and expresses the breadth of our traditions, lifting up aspects of our life that could be recognized in almost every Episcopal congregation. The cover design is beautiful, and the binding is solid, especially for a large paperback volume. 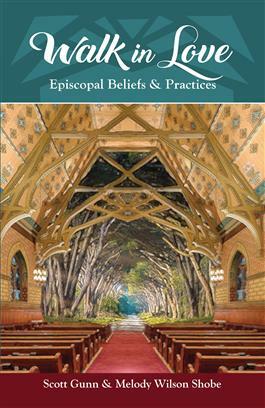 As I noted in the blurb I gave to the editors after my initial reading, I believe that this book is the most comprehensive, and comprehensible, guide to Episcopal faith and practice available. It is perfect book for new comers, long-time members, and anyone in between. Forward Movement is also publishing a free curriculum called Practicing Our Faith that is based on Walk in Love. This curriculum will be available in the spring of 2018. The Rev. Adam Trambley is rector of St. John’s Episcopal Church in Sharon. This entry was posted in Spirituality, Uncategorized, Worship and tagged book review, books, Rev. Adam Trambley, Walk in Love. Bookmark the permalink.